The Universal Metal Filter Wrench - Rescue Wrench is constructed with a half circle style and is the ideal filter wrench for tight spots and odd housings. 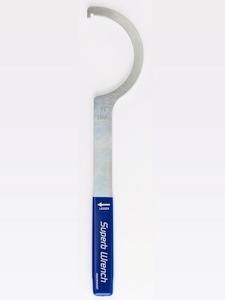 This water filter wrench is constructed with a longer handle for better grip and leverage. The Rescue Wrench won't bend, bow or break due to its formidable zinc-plated, galvanized steel construction. This filter housing wrench is labeled with a directional arrow to make sure you turn it in the proper direction. Inside Diameter (not from the tabs) - 4.5"